MASCOT spring cylinder linear actuator is a powerful, high-performance pneumatic actuator, which provides positive throttling or on-off operation to pneumatic control valves. Uniquely designed compact sized cylinders actuators accept supply pressures up to 150 psi, making very high thrusts available in a relatively compact unit. The basic 4 sizes cater to almost 85% of a plant’s requirement hence reducing the inventory & cost of maintenance spares. The MASCOT spring cylinder linear actuator is fully field reversible for air to open or air to close action without additional parts; a spring provides reliable fail-safe operation. Air is supplied to both the sides of the piston by the positioner providing very stiff and precise movement along with very high frequency response. High thrust cylinder •	Operating pressure of 150 psi (10.3 Bar) permitting substantially higher thrust capabilities than diaphragm actuators. High Frequency Response •	Double-acting configuration responds quickly to signal changes. Lightweight & Compact •	Substantially lighter and more compact than comparable linear diaphragm actuators. •	Offers ease of maintenance. Wide choice •	Four basic actuator sizes 25, 50 and 100 & 200 can handle thrust requirements for over 85 percent of valve sizes in a plant. Least number of parts •	33% less parts than diaphragm actuators. •	Cost of wearing parts is 10% than compared to diaphragm actuators allowing low spare parts inventory and maintenance costs. Excellent Positioning Accuracy •	Powerful pneumatic stiffness allows a high pressure drop without plug slamming onto the seat due to air volume between the piston and the bottom of the cylinder. Low Air Consumption •	Cylinder design uses less supply air than comparable diaphragm actuators. Longer Stroke •	Longer strokes provide better process control. Size 25 spring cylinder linear actuators have a 11/2-inch (38 mm) stroke, in contrast to a 3/4-inch (19 mm) stroke on a comparable linear diaphragm actuator. Larger actuators have similar comparisons; stroke lengths are available up to 24 inches. 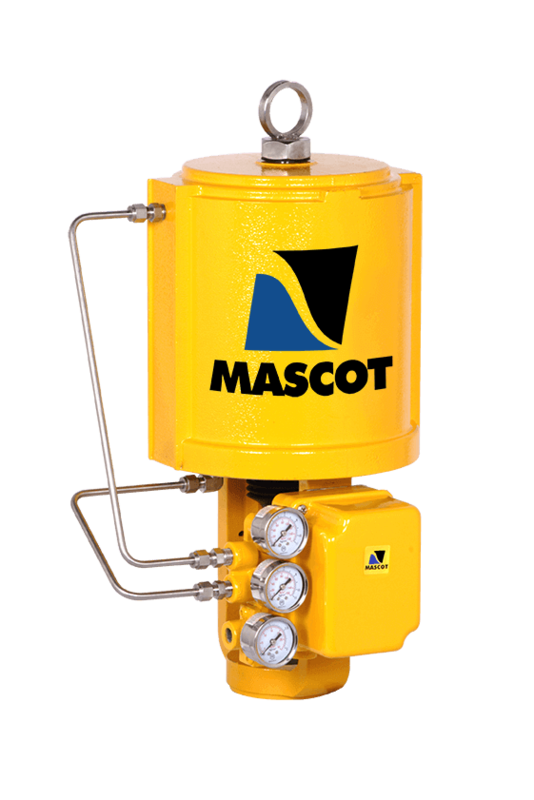 This increases the rangability of MASCOT Control Valves. Field Reversible •	Failure mode is easily reversed without additional parts. Reduces inventory costs. No Pressure Regulator Required •	Cylinder actuators easily handle air supplies up to 150 psi (10.3 Bar) without a pressure regulator and can be operated with as little as 30 psi (2.1 Bar). Simple Maintenance •	Periodic maintenance is easy to perform since the spring cylinder actuator only requires the removal of three parts to access all internal parts.